The participants were college students who attended an accredited private college offering associate, baccalaureate, and graduate degrees in the western United States. The research variables included student choice of modality (either OL or FTF), the covariate was students’ GPA. Data were collected from institutional records and analyzed through descriptive statistics and multiple regression analyses. The findings revealed that student choice of modality affected FTF course drops. The IV choice of modality had significant relationship to course completions, which indicated that choice of modality decreases the chance of completing courses. These findings support institutional decisions in helping students with course modality selection and in developing policies and procedures that may lead to increased retention, student performance, and student satisfaction. DeCosta, J. (2013). What is the impact of students’ ability to choose across and within course modality (OL or FTF) on course completions?. 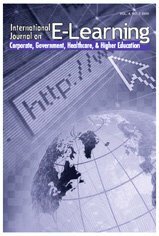 International Journal on E-Learning, 12 (1), 45-67. Waynesville, NC USA: Association for the Advancement of Computing in Education (AACE). Retrieved April 19, 2019 from https://www.learntechlib.org/primary/p/35468/.